Star Wars actor Mark Hamill is apparently "speechless" after finally receiving a star on the Hollywood Walk of Fame. Many fans of Star Wars and Hamill had already assumed that he had a star, but in fact he did not and the same goes for the late Carrie Fisher. When Fisher passed away in December fans made up their own star for the actress best know for portraying Princess Leia. In addition to playing Luke Skywalker, Hamill is also known for supplying the voice of the Joker in the DC Animated Universe as well as the wildly popular Arkham series of video games. After news spread of Hamill receiving the star on the Hollywood Walk of Fame, the actor Tweeted a simple hashtag that read "speechless." 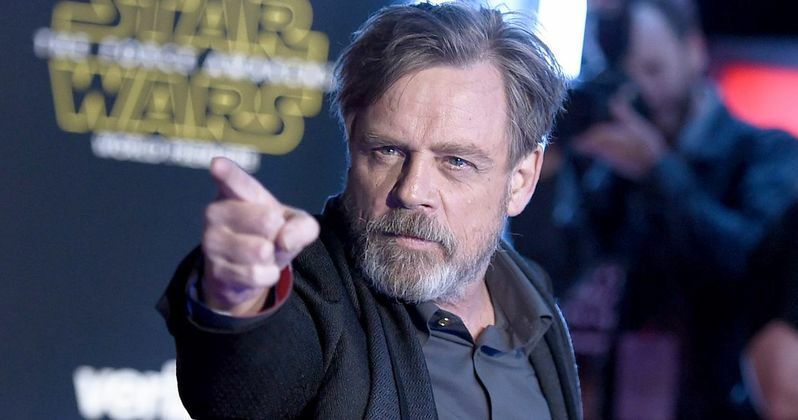 Hamill is a pop culture icon and has recently gone back to his Star Wars roots to have a small role in 2015's The Force Awakens and a major role in the upcoming The Last Jedi, which is set to hit theaters this December. While Carrie Fisher and Hamill hadn't had stars on the world famous stretch in Hollywood, Billy Dee Williams and Harrison Ford both received the honor years ago. Ford got his in 2003 while Billy Dee received his way back in 1985. Mark Hamill is set to get inducted in 2018 along side 34 other actors including Jack Black, Zoe Saldana, Jeff Goldblum, Minnie Mouse, Nick Nolte, and many more. As far as Carrie Fisher receiving a star on the Hollywood Walk of Fame, there are restrictions for stars that have recently passed away. That being said, Fisher will not be eligible until the year 2021 at the earliest, 5 years after her death. Looking at the list and one surely would have thought that both Nick Nolte and Minnie Mouse would have already received the honor as well. In addition to contributing to the world of the arts, nominees must also demonstrate community service and "civic oriented" participation. If that wasn't enough, the star is then charged $40,000 to get install the star, though studios more and fan clubs more often than not pay for the privilege. Mark Hamill revealed his surprise of the honor through Twitter and the actor often spends time interacting with fans and peers through the social media medium. Recently Hamill was asked about the goofiest Luke Skywalker themed toy/merchandise that he'd seen in the 40 years of Star Wars. Hamill responded with the 1981 Tauntaun toy that had a belly that you can stick Luke into, definitely a worthy of such an honor. But as far as bizarre Star Wars merchandise goes, Hamill updated his list with the Jar Jar Binks candy where you candy is Jar Jar's tongue and you have to, well... you know what you have to do to taste the candy. The star said "Close the polls- we have a winner." Mark Hamill truly deserves a star on the Hollywood Walk of Fame and it's about time he received the honor. Hamill and the entire cast of Star Wars deserve a star for positively effecting the lives of millions of people the world over. Luke Skywalker is a cultural icon and fans all of over the world should be excited for Hamill. Hamill will return to the big screen as Skywalker on December 15th, 2017.